Why Consider a WRS Virtual Front Desk? As with any business, big or small, a practice could use a virtual front desk to reduce not just costs but to cover the growth of your business or to provide talent or skill that’s needed temporarily or on a full-time basis. As a physician, you work hard to get things done. But often you need help to juggle the many tasks of managing a practice. WRS Health can provide the service as a combination or a single service. The option is yours to choose. Your trained virtual front desk can work from a minimum of 20 hours per week to a maximum of 50 hours. 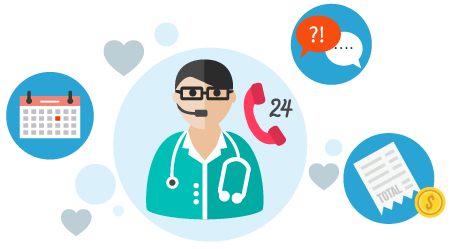 Appointment Reminder Confirmations – call patients in advance to remind/confirm their appointment details in addition to alerting them what their patient responsibility will be, at the time of visit. Eligibility – check eligibility 24 or 48 hours in advance (practice choice) of your current patient appointment list and follow up on any bad returns, prior to the patient visit. Collections – work on reducing your patient balance by calling your patients to make payments on their current account balance. Chart Check – check the patient’s chart in advance of the appointment to verify labs, authorizations/referrals. Online Presence – engage with patients to collect responses from your patients queries or reviews. See the results of efficient customer handling, focusing on your core operations, reducing the workload, and much more.